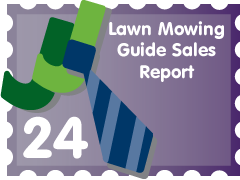 When I first wrote the JuniorBiz Business Plan, I projected selling 750 copies of my Lawn Mowing Guide by the end of the year. All you have to do is write it and put it on Amazon, right? Unfortunately it’s not that easy. I’ve only sold 15 copies since I published it in April, but I’ve learned several lessons along the way. I obviously had high expectations for selling my first book and the Lawn Mowing Guide just didn’t cut it. Besides the fact that I didn’t sell as many books as I wanted to, they also didn’t sell how I thought they would. Eight of those were sold at speaking engagements and three were to people I have known for awhile. I’ve also given away about 10 copies to friends and family. The book was sold on JuniorBiz.com and the ebook was sold on LawnMowingGuide.com. My editor, Nick Scheidies, sold a copy to one of his mom’s patients who happened to know the co-author, Emil Motycka. I didn’t sell my first copy on Amazon.com until last week despite being atop the list when you search, “Lawn Mowing Guide”. I had the Lawn Mowing Guide on Ebay for 30 days in the middle of the summer and haven’t bothered to repost it. Selling 15 books has yet to cover my costs for the whole process, but I don’t consider it a loss. I plan on publishing a few more books over the next year and this experience has taught me some valuable lessons. Lesson 1: People tend to buy from people they know or meet. People are especially cautious with their purchases when money is tight. Unless it’s something they know they need, people aren’t going to buy. It takes a lot of convincing. And the easiest way to convince someone is to talk to them in person. I’m not saying I’m an excellent salesman (in fact I’m terrible at it), but if people can see and talk to me before they hand me their hard-earned cash, there’s comfort for them in that. Lesson 2: Unless you’re an authority, you’re going to have a tough time selling an informational product on the Internet. The supply of things to buy online is growing much faster than demand. The increasing ease of online publishing is making it possible for anyone to create a website. And once online, people try to sell stuff. I’ve found that the most successful informational products (i.e. books, ebooks and even online courses) are being sold by the most authoritative figures on the Internet (i.e. Darren Rowse, Brian Clark, Yaro Starak, etc.). Once you’ve established yourself as a credible resource within your niche, people feel more at ease buying from you. This goes along the same lines as Lesson 1. Lesson 3: Writing a book or developing a product is much easier than selling it. All it takes to write a book is discipline. I don’t want to say it’s easy, because it’s not. But when you’re developing a product, you’re the only one you have to motivate. When you’re selling that product, you have to motivate other people. You have to determine who you’re trying to sell to, what motivates them to buy, figure out how you’re going to communicate your message and then go out and do it. It’s a lot easier to sit at my computer and type. Not as rewarding, but easier. This summer may not have gone exactly as planned, but I have a book that doesn’t just expire at the end the lawn season. In addition to the Lawn Mowing Guide, I’m going to be writing the Internet Marketing Guide this fall. I’m excited to start working on it later this week! Something I haven’t mentioned on this site before is that I’m going to be writing another book under the 50 Interviews license, 50 Interviews: Young Entrepreneurs. This will be a collection of interviews from 50 of the most successful young entrepreneurs in the world. My list is up to 34 already and it’s growing every day. This is going to be an absolute blast for me! I just hope they’re all willing to talk. Realize that this is just one person’s experience with selling one book. I’ve found plenty of people who are about as well known as I am, yet much more successful. If you’re one of them, please leave your comments below. Also, if you have any suggestions for me, I would love to hear them! Thanks for reading and if you enjoyed this post, you should get JuniorBiz by Email..